♥: Joy and whoopee pies! Hey everyone! It's Friday so that means I have a few days to kick back! No Black Friday shopper here. I feel very fortunate to say that there was nothing I needed to be up at 3:00 AM and waiting in line for this morning. My daughter put 3 items on her list for her Secret Santa we do every year with my family: coat, piano music, candy. Interesting huh? I knew she wanted piano music because we have been searching the net looking for sheet music to various Christmas songs. The candy I am not so sure about. She seems to think I limit her intake of this too much. We just went to Trader Joes' and I bought her peppermint whoopee pies . Okay, maybe they were for both of us. I would eat one of these over candy any day! Pretend there is a picture here of the whoopee pies. I hope to get one before they are gone! Instead I share a yummy gingerbread card I made. My card for today was created with no holiday paper. I love when I can muster the mojo to do this. It seems I sometimes get stuck and think I can only use Christmas paper when. making a Christmas card. So not true. I need to get some things taken care of quickly and just realized the time. Eeek! More later! A Spoonful of Sugar: #131 "Anything Goes"
Stampin B's : #86 "Holiday card"
Love those colors!! That gingerbread man is just the cutest!! Im with you nothing I need or want enough to get in line at 3am. What a sweet image and card! Lovely card. I love the gingerbread man - hes fab!! This is so sweet, adorable gingerbread man! I think your daughter is adorable, so cute for her to ask for music! Your gingerbread man is a cutie :). I love this card; soft, sweet, elegant and perfect for the Holidays. Your daughter asked for sheet music; maybe an idea to ask aruond in your neighbourhood or school? Maybe someone is having some of it and let you copy it... and she can practice in the upcoming days. ( Just an idea :) !!) It's always lovely to hear children making music. So cvute and so unique! Lovely card! How cute is that gingerbreak man, Amy?? Love your card. And lucky you that your daughter's list is so short! such a fun card...wow, no holiday paper...you rock! 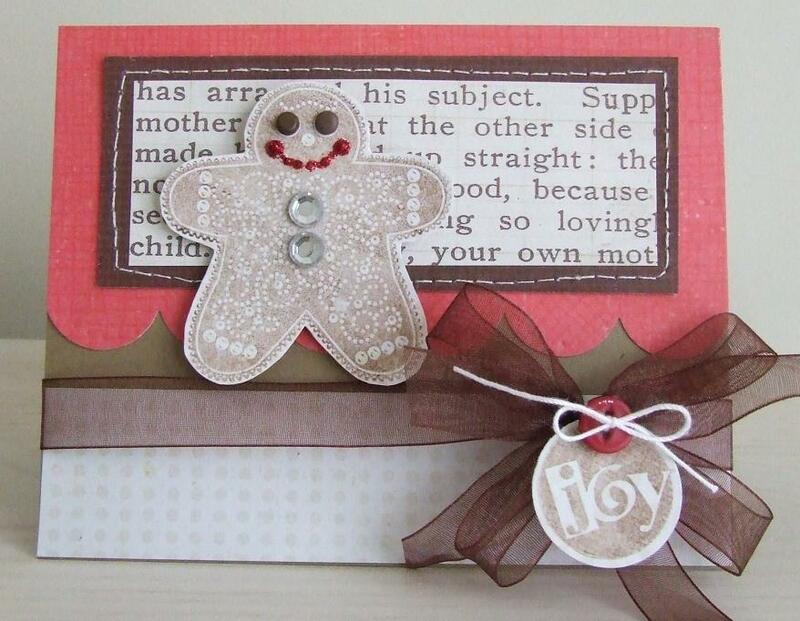 What a darling gingerbread card. I love to smell it baking, too. Yummy! I love his cute smile. So glad you joined the Stampin B' this week with your wonderful creation. Fabulous card ... Christmas is so much fun when you have a child in the home ... your daughter sounds a delight! That card is amazing!!!! do u sell them? cause you should they rock!!! Sooooo cute!!! I love the little gingerbread man!!!! Cute, cute gingerbread man -- love his bling! Thanks for participating in the Creative Belli Challenge. LOVE the bow! LOVE the Joy tag! And of course that stamped gingerbread man is too CUTE! !